Every once in a while you meet someone who you think is really cool. And that’s what I thought shortly after meeting Alexia Hannam, a helicopter pilot with the Royal Canadian Air Force. I fully expected she would be a strong and intelligent woman, carrying traits befitting a military leader, but I was also quickly struck by her fun, friendly and passionate nature. Alexia Hannam speaks with displaced residents from Fort McMurray in May 2016. Every once in a while you meet someone who you think is really cool. On August 4, 2017, Hannam assumed command of 417 Combat Support Helicopter Squadron, which at the time was in Kamloops, BC, for Operation Lentus after the province declared a state of emergency. A system of strong winds and lighting had ignited more than 220 wildfires in BC’s dry interior region. More than 45,000 people had been displaced by the wildfires in the first two weeks, including some 14,000 evacuations from Williams Lake and surrounding areas. It was the second time in little over a year that 417 had responded to a state of emergency after a devastating wildfire swept through Fort McMurray, AB, forcing upwards of 88,000 people from their homes. It is a rare occurrence for a change in command to take place in the field, but with BC’s wildfires continuing to burn into early August 2017 it might have been several more weeks before 417 returned to their base at 4 Wing Cold Lake, which is Canada’s busiest fighter base. With more than 10 base squadrons, 4 Wing hosts Canada’s world-class tactical fighter force training and deploys and supports fighter aircraft to fulfill the roles of Canada’s Air Force. 417 Squadron is a dedicated on base search and rescue unit primarily tasked to conduct rescue for 4 Wing’s fighter units, with a secondary role to augment national search and rescue capabilities. The squadron holds three CH-146 Griffon tactical transport helicopters – in service since 1995 – and some 50 personnel. On that day in August, Major Hannam joined Major Lauri Darras, Commander of 444 Combat Support Squadron from 5 Wing Goose Bay, as the first two female officers to command Combat Support Squadrons in the Royal Canadian Air Force. Hannam’s first memory of wanting to fly was from when she was five years old in kindergarten, hoping that if she ran fast enough up a hill in the schoolyard at recess that she just might take off high up into the sky. By grade three, her experiments in flight materialized into a crude self-made hang-glider. Neither effort worked out as planned, but it didn’t stop her from figuring out how to attain her dreams. Alexia Hannam speaks with displaced residents from Fort McMurray in May 2016. 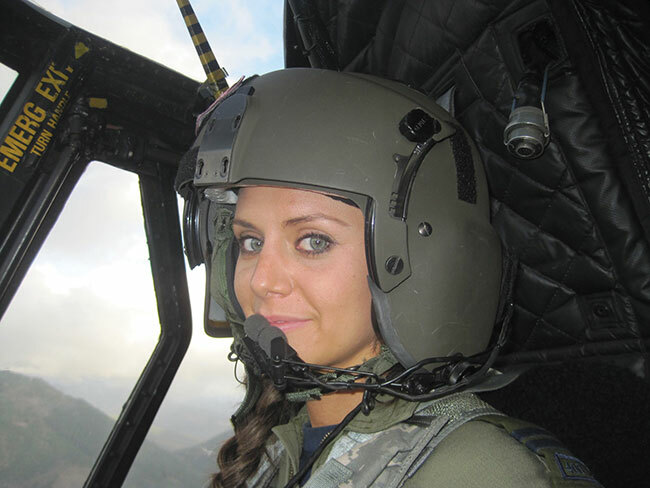 Major Hannam never thought about getting into the military at a young age, but she would not look back after realizing it was an opportune and potentially rewarding path to becoming a pilot. She has now served in the military for 17 years. Hannam has moved around Canada during her training including five years in Ontario, one year in Quebec, and some time in Saskatchewan. Seven years of her career were spent in Edmonton as a tactical helicopter pilot at 408 Squadron, from where she was deployed to Afghanistan to fly Chinooks, huge twin-engine, tandem-rotor, heavy-lift helicopters. 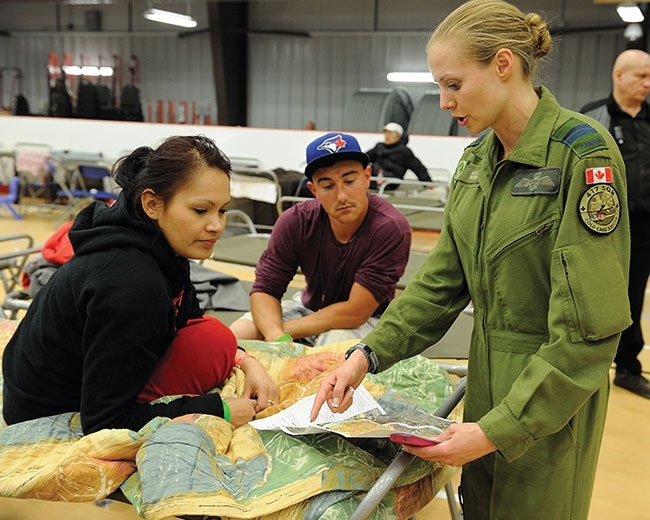 She now has more than 40 combat missions under her belt and has spent the last three years in Cold Lake moving into the base’s critical search and rescue role, where you can be deployed at a moment’s notice. She then describes her deployment to Afghanistan as extremely rewarding, explaining how flying troops around meant keeping them off the roads, where there were a lot of improvised explosive devices, to keep them in a safer environment. Now Hannam spends her time in Cold Lake, preparing the squadron and its modified B412 Griffons to rescue fighter pilots from ejection scenarios, or to respond to natural disasters, or search and rescue missions. She has also begun to mentor young women who are interested in aviation careers through Elevate Aviation. Kendra Kincade is founder of Elevate Aviation and an air traffic controller with NAV Canada. Canadian fighter jet crashes in Cold Lake, Alta.